OTTAWA, CANADA - Eurocom Corporation, a leader in innovative notebook technology has included the Pen&Internet's riteNotes™ complete note-taking software with all of its EUROCOM T200V Convertible tablet PC computers. The EUROCOM T200V model equipped with an advanced electronic ink and handwriting recognition software developed by Pen&Internet™, will provide customers with more functionality and a lower price than any of the tablet PC systems on the market. The EUROCOM T200V Convertible, which is both a pen tablet and a pen laptop, is targeted towards mobile professionals and vertical markets, such as pharmaceutical, medical, educational and legal industries and is slated for commercial availability this fall. Eurocom has chosen to use ritePen and riteMail software over MS Tablet Operating System because of better technology, open architecture and compatibility with all different versions of Microsoft operating systems. 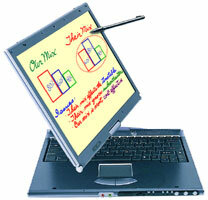 The RiteNotes software is an add-on to an existing operating system. Pen&Internet: Pen&Internet, LLC, a division of Parascript, LLC develops advanced electronic ink, recognition and communications technologies, products and services for mobile, pen-enabled computers and devices. Headquartered in Sunnyvale, CA, the Pen&Internet team has advanced engineering and R&D teams with over 70 years combined experience in these technologies. Please visit www.penandinternet.com and www.ritemail.net for more information.